It's like someone said, "Hey, there aren't enough free bases on Abyssal Reef (five), let's make a map with six bases behind two narrow chokes and call it King's Cove!" I don't think we're due for another crash for a few more seasons yet though. Which sounds absolutely preposterous coming out of a map pool with Para Site, Cerulean Fall and Port Aleksander. I decided to check if maps are actually getting bigger, since I think lots of people have that impression. The results were... mixed I guess? This is a chart of the median size of two player maps in the map pools of all of LotV. I only looked at area since that was the easiest data to get, and I wasn't sure how to weight multiple factors like rush distance and so on. And ofc a few maps have misleading areas (like Dasan Station has a larger area than Neon Violet Square). 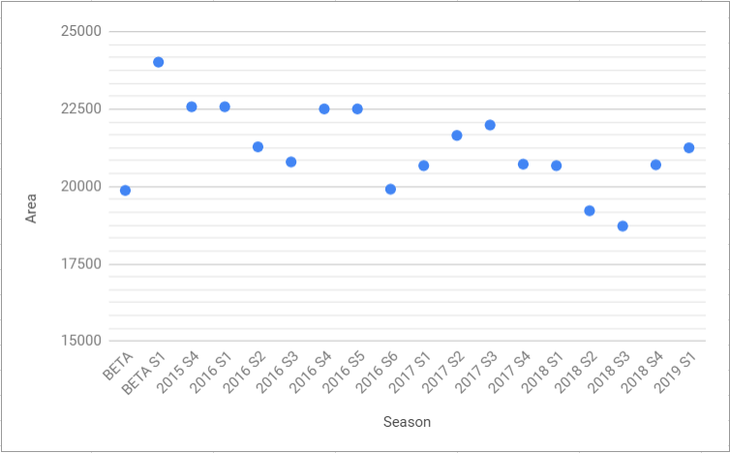 So the trend is upward over the last few seasons, but not really overall. Year Zero kinda reminds me of Habitation Station but with rocks at the northern-most third instead of it being an awkward gold base. King's Cove does indeed appear to be basically Abyssal Reef but mirrored and with an extra base. That's fine by me. This pool is kinda lacking in the diversity department. A lot of really big maps. Glad Para Site and Blueshift are gone. I was getting pretty tired of those two. Sad Cerulean Falls is going. I had a lot of interesting games on that. Maybe count the number of bases? Not sure - I mean, let's take a look at that map with the white paint thingy ... dream something. It wasn't particularly big, but because the bases were not close enough it seems bigger because you have to move your units far away to defend the bases(or conquer them ). But base-base travelling distance was standard one. Also the map size alone doesn't mean a thing if big parts of the map are unusable. Not sure how to measure this, sometimes it's just the mind playing tricks on folks and how people veto maps. I think every single map pool is the same, you are always one veto short of having a good ladder experience. I guess what it is in the end is not just the overall area but a mix of that, rush distance, perhaps base counts and definitely terrain. For example, King Sejong Station is bigger in area than Lost and Found. But Lost and Found feels astronomically huge by comparison when playing on it. and a final thought: whoever writes the official map descriptions could be doing better, or they could just be scrapped in favor of having actual players or mapmakers try analysis. the semi-"in universe" descriptions all sound exactly the same and add nothing but mild confusion. "this map has rocks/multiple paths. watch all the paths as you seek victory on this mysterious meadow/abandoned space station/charred valley/blahblahblah"
The comparison originally comes from the person who made both King's Cove and Abyssal Reef. Maru is the best Terran ever. These look like good maps! Especially liking Cyber Forest and New Repugnancy, gotta see how the others play out once the season starts. Good job map makers! Well I hope King's Cove gets fixed before hitting the ladder otherwise it's a hard veto for toss players. With my walls, the same banelings cannot kill the pylon + the adept. And if banelings are used to kill the pylon, there is another pylon to power all the buildings and keep the wall sealed. Also note that even though the adept filling the gap can't defend the stargate, the rocks also need to be defended, so he's not completely wasted there. There's just a lot to defend so build orders will probably have to be adjusted. Personally I will play some 2gate FE openings but I think 1gate FE stargate can still get some wins too. With both pylons down there, you'll have to build the twilight down there as well. It can be used as part of the wall in anticipation of the rocks breaking. Or it can be tucked in safely, as there's plenty of room. 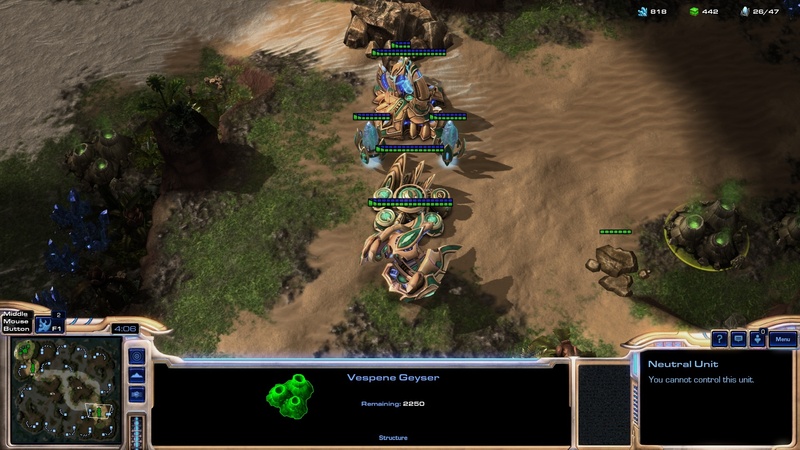 For most ladder brackets, protoss players can safely anticipate zergs attempting heavy lings/bane early on. If you play carefully and defensively, then I think a lot of protoss can get easy wins, especially since there will be zergs feeling obligated to do this aggressive style when they aren't actually very good at it. The tricky thing will be when a zerg can successfully present himself as aggressive when he's actually playing very greedy. So ultimately I think protoss will want to start with a build that is safe against ling/bane aggression but then transition into a build with a strong timing or poke or harass in order to keep greedy zergs in check. 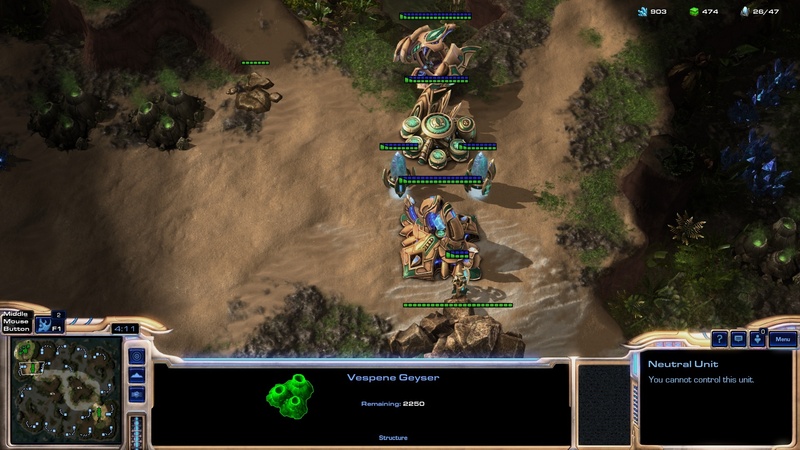 There are certainly a lot of interesting things you can do as Protoss player to try to handle the weaknesses caused by a wide natural choke (with rocks as a bonus) and the resulting strenghtened early ling attacks, baneling busts and ravager attacks. This wall you have here is quite cool. However (even without speaking about the balance impact) the way it limits Protoss options isn't the most compelling thing as a viewer. Darkness Sanctuary also had the wide nat. choke, and it didn't have a positive impact there. Wow I didn't realize that the possible walling for the natural was like that. The pictures comparing it to the original show that Blizzard randomly increased that area by 2 squares. I'd be curious to know why they did that. That map just went from being one I was excited about to an automatic veto unless that's fixed. I was active when Darkness Sanctuary was on the ladder. I remember figuring out my own wall there that got the job done and wondering why pros were not doing a similar or identical wall as me (not that they'd copy me but I thought they'd independently figure it out). I saw walls that I thought were objectively worse and they sometimes suffered for it. Building formations are one of those things that pros sometimes overlook. Kind of reminds me when pros cannon rush and they make decisions that I think Printf has figured out are objectively sub-optimal. There are little pockets of expertise that non-pros can sometimes develop that end up surpassing what's done in tournaments. Anyway, Darkness Sanctuary had its own challenges for PvZ once you safely got past early game. King's Cove might be a more tempting map for pros to solve the early game so that they can enjoy all those expansions after that.